The Juzo Classic Class 1 Compression Arm Sleeve is for use in lymphology and scar treatment and is a specialized compression garment for the arms. 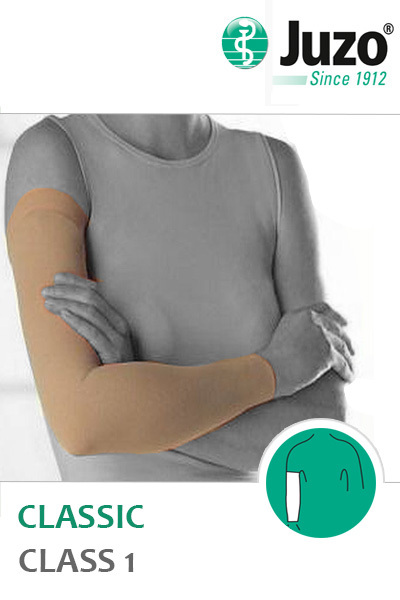 Offering great levels of comfort and effectiveness, this sleeve is perfect for a wide range of conditions. Juzo's Soft Fabric: Super-soft materials have been chosen by Juzo to create the most comfortable compression garments for limbs in need of an extra boost whether going through recovery or going about every day life. After a breast operation: It is common for an arm lymphedema to form due to damage to the lymph vessels and the removal of lymph nodes. An essential component of any therapy, as a follow-up to lymph drainage, is compression therapy. The compressive and intense massaging effect - in particular in the case of flat-knitted garments - helps maintain the reduced arm circumference achieved by manual lymph drainage. Healing of scars: Particularly in the case of scar therapy, a well-fitted compression garment reduces the bothersome itchiness. The uniform surface pressure helps heal the scar area and leads to a reduction in scar thickness. Compression therapy can also be beneficial for long standing scars. Therapeutic pressure in scar therapy: The constant surface pressure exerted by the compression garment enables the scarred area to heal more quickly. The consistency of the raised scar begins to change within just a short time, and the scar tissue becomes softer. The redness of the scar tissue recedes and the scar thickness decreases. Scar shrinkage, and the resultant joint stiffness, is also reduced. Even long standing scars can benefit from compression treatment. Lymphedema: An accumulation of lymphatic fluid in the tissue. The affected region is highly swollen, and the affected person suffers from a feeling of tension, pain and restricted movement.In a long-standing lymphedema, the connective tissue hardens (induration). This is confirmed by the clinically important Stemmer's sign: The skin on the fingers can no longer be pinched into a normal fold, and cannot be lifted or is difficult to lift. Wearing compression garments can help with the treatment of lymphedema. Click the image below to view Juzo's sizing chart for the Classic arm sleeve range. Juzo Classic Class 1 Compression Arm Sleeve are non-returnable and non-refundable on grounds of hygiene. It is vital to always consult with a doctor before choosing compression garments to wear and the level of compression that you need should be decided by a professional. Compression Stockings.co.uk is not intended for use in lieu of medical consultation and our staff cannot advise you about your condition. Please use the chart below to find the size of Juzo Classic Arm Sleeve that is necessary for your requirements. Measure the circumference of your arm (in centimetres) at the indicated points and use the data to find the appropriate size. If your measurements are inconsistent with a single size, we advise that you pick the largest size necessary to ensure the best level of comfort. Please be aware that these arm sleeves are available in "normal" and "max" version. Max codes are shown in the lighter green boxes on the chart.